UC ANR Vice President Glenda Humiston announces the establishment of two endowed chairs in UC Cooperative Extension. UC Agriculture and Natural Resources (UC ANR) has established two $1 million endowments and is now preparing to select the recipients of its first-ever endowed chairs in Cooperative Extension, announced UC ANR vice president Glenda Humiston today (Oct. 29). The endowed chairs will give two scientists a dedicated source of funding for their ongoing agricultural research. 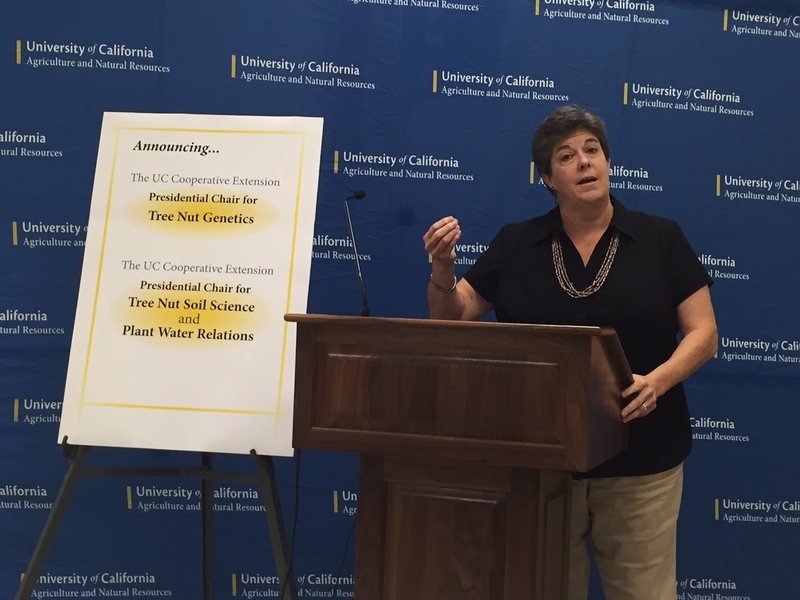 Half the funds for the endowed chairs was provided by UC President Janet Napolitano; the other half was donated by the California Pistachio Research Board. One is the UC Cooperative Extension Presidential Chair for Tree Nut Genetics; the other is the UC Cooperative Extension Presidential Chair for Tree Nut Soil Science and Plant Water Relations. UCCE is the applied research and outreach arm of the University of California that serves the agricultural industry, coordinates the 4-H program, supports natural resources stewardship, and provides nutrition education programs throughout the state. The California Pistachio Research Board has a long history of funding ANR research. Since its establishment in 2007, the program's donations have totaled more than $3 million. Relative to other major California commodities, pistachio production is new. The first commercial crop was produced in 1976. In 2014, farmers harvested 519 million pounds of pistachios, valued at $1.8 billion. Tom Coleman, a Fresno County pistachio farmer and chair of the Pistachio Research Board, said he enjoys informally comparing notes with other growers, but that doesn't substitute for scientific research. In fact, the industry has already felt the impact of climate change on yield. The pistachio growers expect the 2015 yield to be nearly 50 percent lower than the previous year, in large part due to a lack of sufficient winter chilling and water supply cuts, said Bob Klein, manager of the California Pistachio Research Board. “We know that our future is going to look better with more research as we face the challenges of a warming climate and less water,” Klein said. Napolitano created the Presidential Match for Endowed Chairs last year for UC campuses and UC ANR to use as an incentive to encourage donors to establish endowed chairs to fund research. Endowed chairs help attract and retain top-flight academics. Once established, endowed chairs provide a dedicated source of funds, in perpetuity, for the chair holder's scholarly activities. Inspiring article, but you left out UCCE Master Gardeners in this segment: "UCCE is the applied research and outreach arm of the University of California that serves the agricultural industry, coordinates the 4-H program, supports natural resources stewardship, and provides nutrition education programs throughout the state."